Dice the fruits and coat them with 3 tbsp of flour. Add rum and mix well. Keep this at room temperature over night. Dice or crush the nuts into small pieces. Place the eggs and butter at room temperature the night before you make the cake. Measure and keep ready the flour, sugar and the flavorings. :- To make the caramel, use a white enameled pot, if you have one. The light surface will help to see exactly the caramelizing process. If you don¦t have one, use a medium saucepan. Place 1 cup of sugar in the saucepan and add 2 tbsp of water. Turn the stove to high and place the pan on the stove and let it boil. :- Don¦t stir the contents at all. As sugar melts and caramelizes, you may swirl the pan a bit once or twice. Within 7 - 10 mins, a cherry wood colored caramel forms. Immediately, remove the pan from the stove and very carefully add 1 cup of water to the caramel. Stir the contents well to dissolve the caramel. Keep this aside. Sift flour and baking powder, a couple of times and keep ready. In a large container, whisk butter first and then add 4 cups of sugar and whisk again, until it is creamy. Pour in the caramel syrup, the flavoring powders, salt and vanilla extract and mix everything together. Add the flour-baking powder mix and fold this in with a wooden or plastic spatula or spoon. 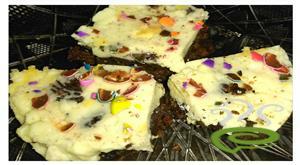 When they are well mixed, add the candied fruits and nuts and mix again. Spoon this into a 10 inch non stick loaf pans. 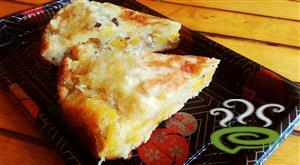 Bake for 1 hour at 350 degree F.
:- You may line the pan with parchment paper or brown paper. 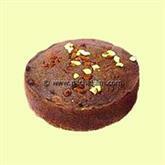 :- Check for doneness by inserting a toothpick in the middle of the pan. If the toothpick comes out clean, the cake is done. If not, bake for another 10 - 15 mins and check again. Remove the cake from the oven and place it on a cooling rake. Pierce the cake with toothpick, and pour Brandy (about 3-4 tablespoon on each) on top and let it soak. 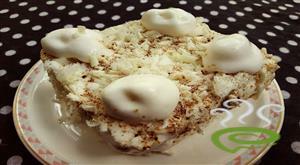 :- This will enhance the flavor and gives a longer shelf life. Remove the cake from the pan only after it is allowed to cool completely. Before storing, cover the cake completely with wax paper first and then with aluminum foil and keep in the refrigerator. Awesome recipe! Made it more than 10-15 times each year since 2012. Thanks for the wonderful recipe!!! This has been my Christmas cake recipe since 2006. LOVE IT!! THANK YOU Latha! I soak my dry fruits in alcohol at least 2 months ahead. I have substituted the suggested brandy with rum. I also sprinkle the cooled cakes with some rum 2 days before serving. The cake came out very well. I think we could try currants, and more cashew instead of dates and the cake will be more soft and moist. Thank you for posting the recipe. My first cake, friends said tastes better than the one from shop. I made two cakes with 10" pan. First one burned because I kept the cake at the bottom of oven. kept the second one at top so came out perfect. I watched youtube videos for butter-sugar mixing. It helped me. Thank you. This is the best Christmas cake I ever made. I only used 3 cups sugar and 3-4 lb butter. Thank you. I made it and for a first time it came out really well. 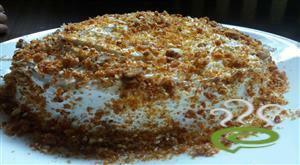 Gr8 taste for the first time of my cake making...Really gud one to try.. Excellent recipe, great to follow, easy to understand, i made it for Christmas and it came out very well, just need to relax and follow the recipe step by step. Excellent! the cake came out perfect! thanks so much for sharing this recipe.. 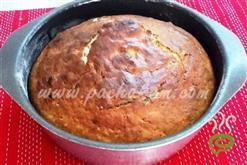 Missed the plum cake from India for many years and kept searching for a good recipe. Tried many others but they did not turn out too well. This was the first recipe where I got the right color and taste. Excellent and would definitely recommend it to friends. Thanks much Latha for sharing. Thank you Latha!I followed your recipe and made this plum cake for Thanksgiving - turned out awesome by followed your recipe step by step.Thanks to you, I enjoyed my favorite cake with friends and family. Even though I made a lot of cake, it was gone in a jiffy! great recipie, i tried with half the ingredients and it came out really well. 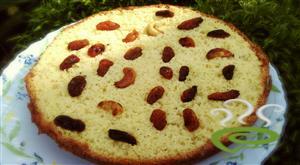 only problem was that the dry fruits setteled down even after dusting the raisins with flour. in case any one has a solution to this problem please advise. I tried this for X-mas, came out really well. Excellent recipe. This recipe was really yummy, I dint use the orange rind and the candied fruits, I used only raisins, cashews and dates and still turned out soft and tasted so delicious.Thank you so much !! Great recipe ! Dear frnz, many of you have the query that why do we add brandy at last!!. The receipie itself says that brandy is added for shelflife. One speciality about this particular cake is that the more you keep them in refrigerator added with brandy, the more it taste. 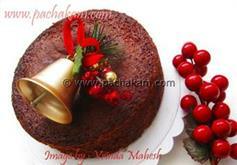 Every x-mas i do try this cake and my neighbours wonder how i prepared it. Thanks and it really worked well. But i need a receipe of the same cake but need to serve only 4 adults ie quarter of the above mentioned ingredients .How can resolve this issue? The cake came out awesome. Thanks for the recipe ! Excellent recipe!!!! I baked for this christamas and it came out very good. I had guests home and they loved the cake. Thanks for the wonderful recipe. Excellent recipe for a cake, I try`d it. it was excellent. I was little doubtful about 4 cups of sugar, but to my surprise the cake is excellento :-) I am going to share it with my friends at work. its was very good.everybody liked it.i have one ques. why to add brandy at last?i didnt find it that good!!!!! but still thankz for the recipe!!!! What is Candied fruits and orange and lemon peel . IT CAME out very well. my husband was surprised . Thank you so much for your recipe. You have put this together really well. Although I followed this recipe to the "T", I was dissapointed to see my cake burnt after 50 mins!!! So, one suggestion would be is to turn the temp. down to 325 F after 30 mins and then to 250 F after 40 mins till its done. I tried it or Christmas.Did not add brandy for flavour.It came out very tasty. (more than bakery standard).Thank you.Everybody liked it. this cake has come out very well. thanks for the recipe.